Wits University demanded an exhibit in solidarity with Palestine, that was meant to continue over the week, be removed today after claiming that it was set up under false pretenses. 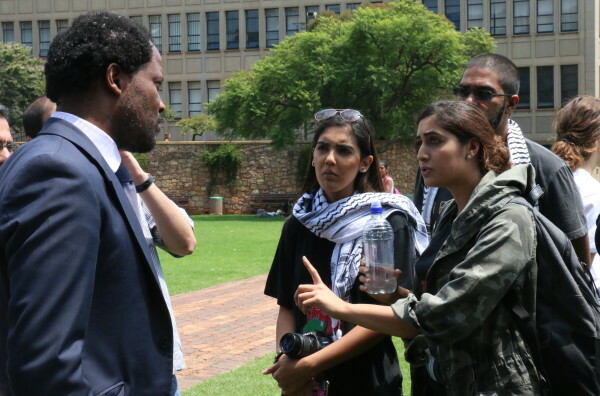 A Palestine solidarity exhibit was disrupted on the library lawns today when Wits University management demanded the students leave after claiming it was set up under “false pretenses”. The exhibit included a banner across the library law and included information about the Israel-Palestinian conflict. The university attempted to shut down the exhibit: “The space was booked for the Orienteering Club under false pretenses. It is now being used to promote #IsraeliApartheidWeek,” the university said in a statement. But according to the organisers of the event all procedures were properly followed and the event was approved by university management. “Everything was approved by them and now all of a sudden when they actually realise what it’s about they want us gone,” said Azra Karim a member of the Wits Palestine Solidarity Committee (PSC). Organisers of the event feel that management is treating them differently due to the content of the exhibition. “It makes us question the motives of management and freedom of expression and freedom of speech is being suffocated by students by them,” said Karim. Concerns about the threat of private security were also raised by the students. “I don’t understand this where private security has become the norm to remove students,” said Karim. The students were told by Deputy Vice-Chancellor Prof Zeblon Vilakazi that the exhibition will need to be removed by 6pm on Monday and cannot remain for the rest of the week as planned by the organisers. The students have however said they won’t go. “We are going to challenge this and we are going to challenge this on a protocal level,” said SRC general secretary Fasiha Hassan.